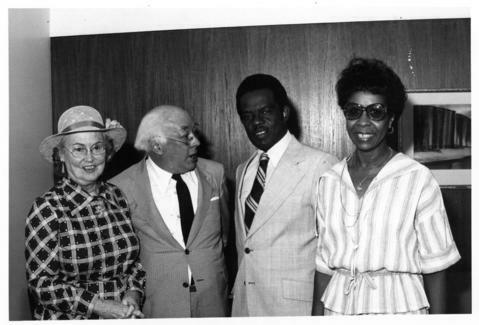 Item is a photograph of the High Commissioner of Barbados' visit to Dalhousie in 1978. Photograph shows (from left to right) Mrs. Hicks; Dr. Henry Hicks; Mr. Stanley L. Taylor, High Commissioner of Barbados; and Mrs. Stanley L. Taylor. Photograph was published in University News September/October 1978. Item is accompanied by a newspaper clipping with a copy of the photograph.